Welcome to the NEMO II Galapagos cruise accommodation section! 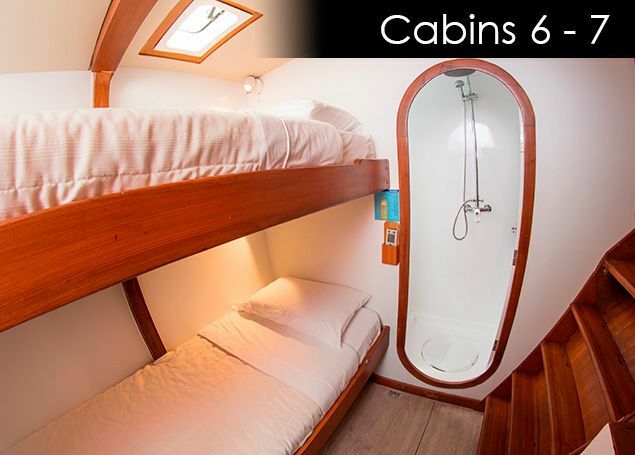 Take a look at our photos below of our cabins that will be your homestay during you NEMO II Galapagos cruise. 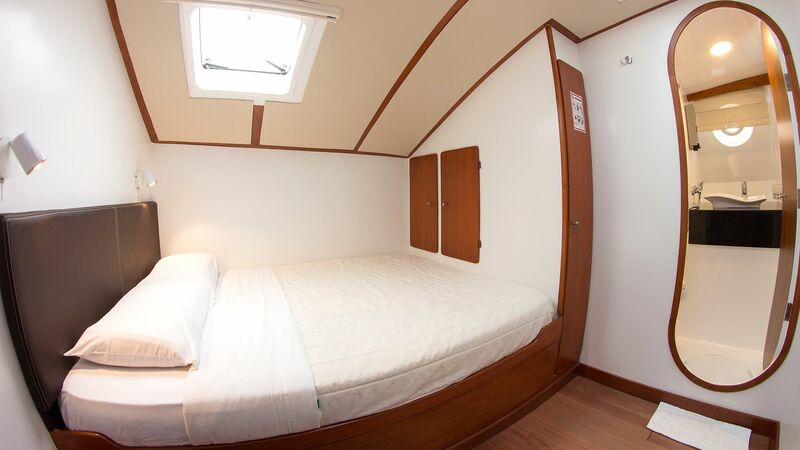 The NEMO II galapagos island cruise accommodation has been recently renovated in 2016. 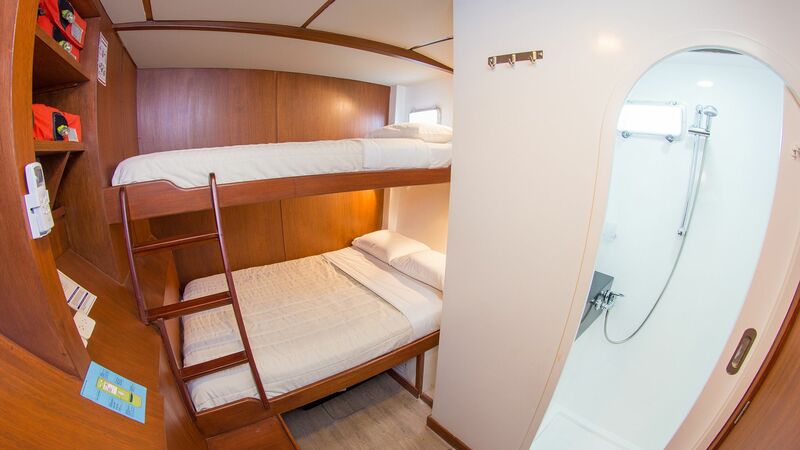 The NEMO II Galapagos cruise accommodation features a modern bathroom and updated bed features. 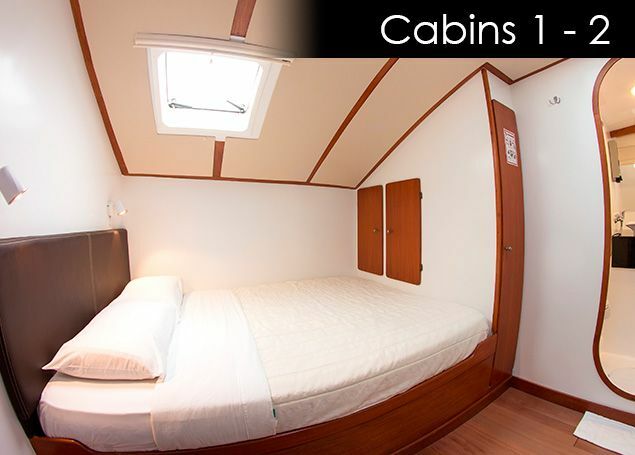 The NEMO II galapagos island cruise accommodation has several different cabin options to appeal to all sorts of groups. 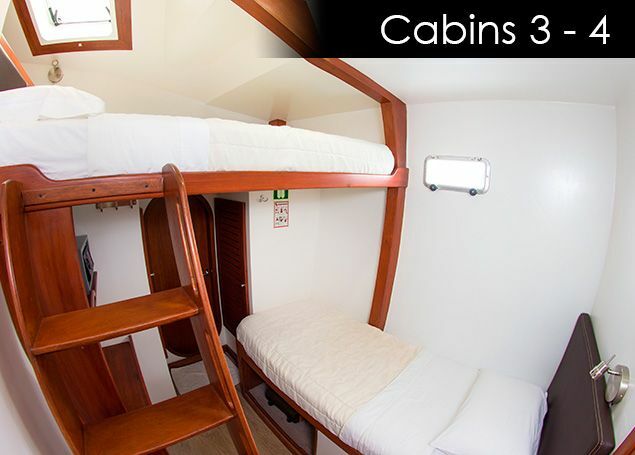 There are two cabins aboard the NEMO II Galapagos cruise that is only for couples with one double bed. 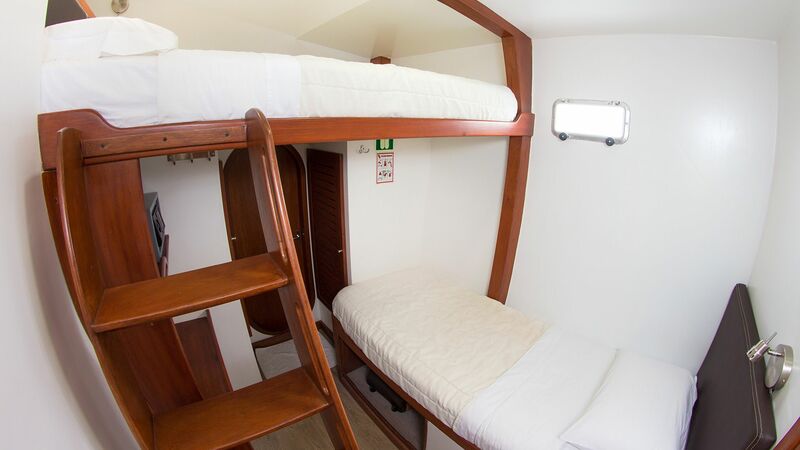 There are additional 2 NEMO II Galapagos cruise accommodation that has a lower single bed and a double upper bed that is typically for 2 adults but can also accommodate a 3rd child. 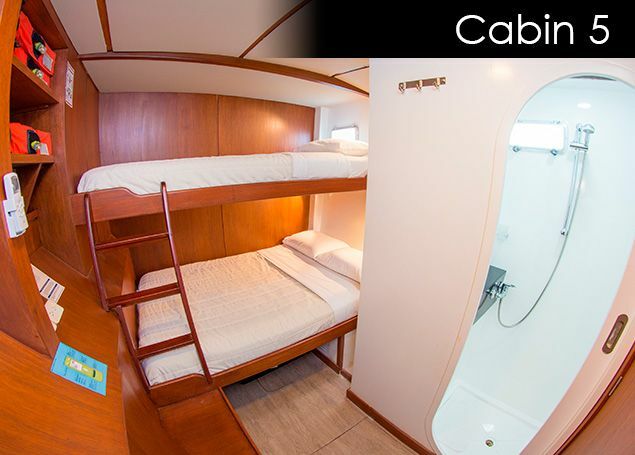 All of the NEMO II galapagos island cruise accommodation has an en suite bathroom and ample space to store your luggage. All the NEMO II Galapagos cruise accommodation is suitable for whether you are traveling alone, with a companion or a group. All NEMO Galapagos cruises are available for also a charter option if you chose to have the entire NEMO Galapagos islands cruises to yourself. On all NEMO Galapagos cruises we make sure that our passengers have a comfortable stay with all the necessities to have a luxury NEMO II Galapagos cruise. On your NEMO II Galapagos cruise you will have several daily excursions and you will be grateful to return to a hospitable NEMO II galapagos island cruise accommodation and have the chance to relax and take a hot shower. Then you venture out into the social areas of your NEMO II Galapagos cruise to either grab a meal or socialize with your fellow passengers. All NEMO Galapagos cruises are an intimate experience that you share with a few passengers island hopping on a floating catamaran. Choosing the perfect vacation can be a difficult decision but embarking with veterans in the industry, NEMO Galapagos cruises, has been providing a total experience for the past few decades. Hopefully, that puts your worries and concerns at ease knowing that your NEMO Galapagos islands cruises are in good hands. NEMO II galapagos cruise accommodation is in excellent conditions after being renovated and there is plenty of space to make it your own. Making sure that the NEMO II Galapagos cruise accommodation exceeds expectations is crucial when making your decision to take your vacation with NEMO Galapagos cruises. The NEMO II galapagos island cruise accommodation is a beautiful cabin that is a sanctuary when you need rest and relaxation. Combining the intimate surrounding of a catamaran with the luxury of NEMO II Galapagos cruise accommodation this is an unbeatable vacation. NEMO Galapagos islands cruises takes a lot of pride in their vacations that they provide to interested passengers year-round and our NEMO II galapagos island cruise accommodation does not fall short of providing a comfortable stay for the duration of their vacation. NEMO Galapagos islands cruise adheres to all the expectations you may have for your trip by not only providing excellent NEMO II galapagos island cruise accommodation but with a professional crew, guide, daily meals and excursions. Put your curiosity to the test and take a NEMO Galapagos islands cruises. The NEMO II galapagos island cruise accommodation is a testament of our luxury services.